It pays to be an active participant on websites like Vocal Point or Kraft First Taste! These promotional marketing sites send full size and travel size freebies PLUS free product coupons for members to sample and then ask them to complete brief surveys about their product likes and dislikes. What you may not know is that the more samples you receive and answer surveys for, the more samples will be offered you! If you receive a free sample or coupon offer, make sure you answer the SUPER brief survey after trying the product or you won't be offered any more free samples in the future. 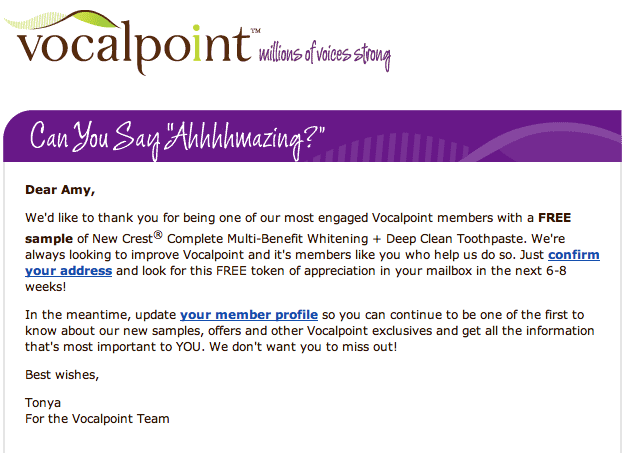 I was just offered a "secret" Free Crest Sample for being one of Vocal Point's most engaged members! 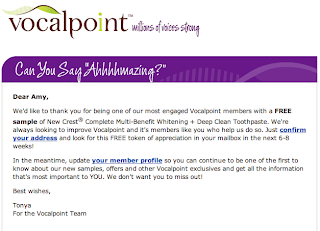 If you are an active Vocal Point member check your email for this free Crest Complete Sample! Not signed up with Vocal Point or Kraft First Taste yet? What are you waiting for - it's FREE! Betty Crocker Fun Da Middles Giveaway Winner! Betty Crocker Fun Da Middles Prize Pack Giveaway!